A detector is a classifier that focuses at one class of interest called the target class. Detectors may be constructed using the sddetect command. It takes a data set, the target class and an untrained model as parameters and returns the trained detector pipeline. 1 Gaussian model          2x1  full cov.mat. One-class scenario, where we only have objects of one ('target') class available. 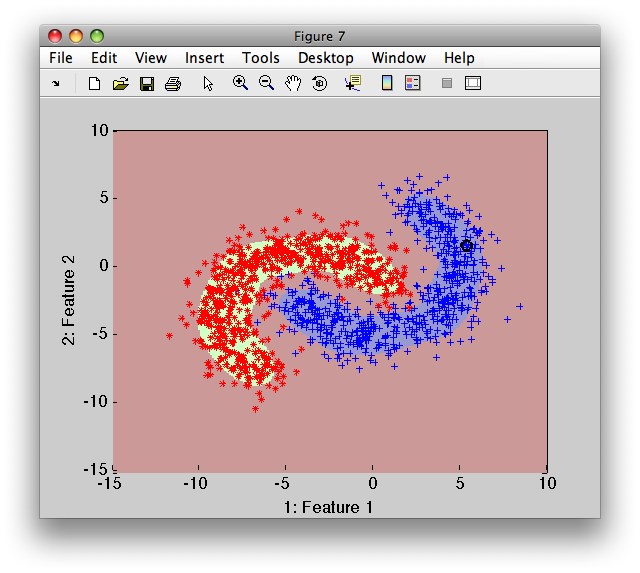 The sddetect trains the model on the target class and then sets the decision threshold on the model output so that all training objects are accepted. Alternatively, we may opt for rejecting some training objects. Decisions of one-class detectors cannot be adjusted after training. Two-class situation, where we have available both target and non-target examples. The sddetect trains the model on target class and then estimates ROC characteristic using both target and non-target data. The performance of the two-class detector can be adjusted any time by changing the ROC decision trade-off. Imagine, we have a fruit problem with existing apple, banana and stone examples and we want to build one-class detector for apple class. To reject more training examples, you may use the 'reject' option. Sometimes, we build a detector for a concept that is not directly labeled in our data set. 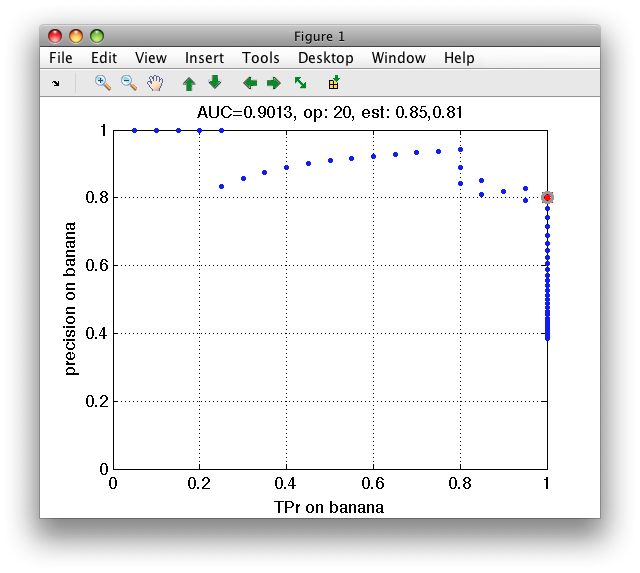 For example, in the fruit problem, we have apples, bananas and stones labeled but may want to create a detector for all fruit. If we specify, in sddetect, a target class name that is not present in the provided dataset, this class will be used for all samples and one-class detector is built. By default, one-class detectors accept all training targets. However, sometimes we may wish to actually reject some target examples. For example, our data set may contain outliers or we may wish to create a tighter one-class description. The sddetect 'reject' option allows us to adjust the number of rejected targets either by fraction or by number of samples rejected. A two-class detector is build other classes than the target class are present in the data set passed to sddetect. Because we specify to build a detector on 'apple', the two other classes ('banana' and 'stone') are considered non-target. The sddetect function displays the renaming rules. It is because, internally, sddetect splits the provided data set a randomly into two parts. One is used for building the target model, the other for ROC analysis. As with any other perClass routine performing internal data split, we have full control of this mechanism. 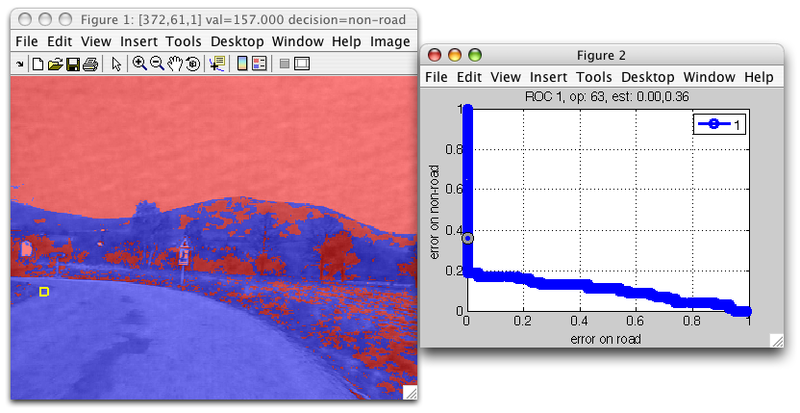 sdimage may visualize decisions of any classifier pipeline trained on image data. 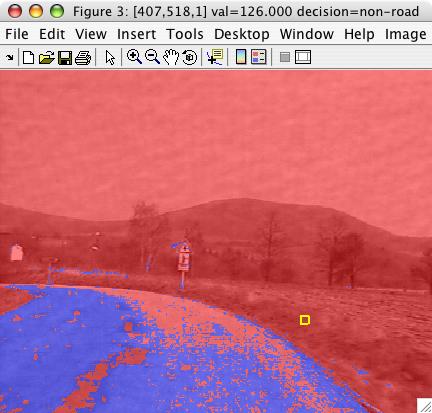 We may also inspect decisions in an image at different operating points. This allows us to interactively analyze detector decisions at different operating points. By default, detector does not store confusion matrices in the internal ROC object. It may be useful to store condution matrices in order to visualize them or use cost-sensitive optimization to set operating point later. This is possible using the 'confmat' option. Rejection refers to the choice we make not to assign the data sample to any of the learned classes. The sample may be either discarded or passed for further processing by a different system or human expert. 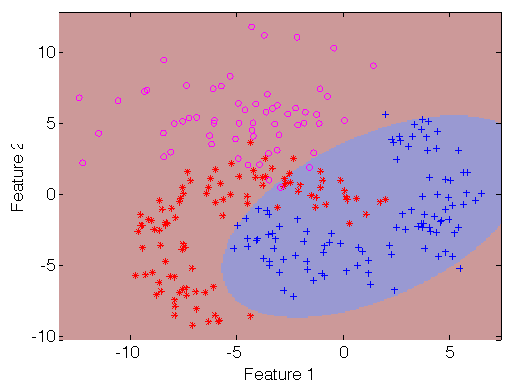 Rejection close to the decision boundary where we reject data samples that fall into the area of class overlap and hence are likely to be misclassified. The fastest way to add a reject option to a trained pipeline is to use sdreject command. 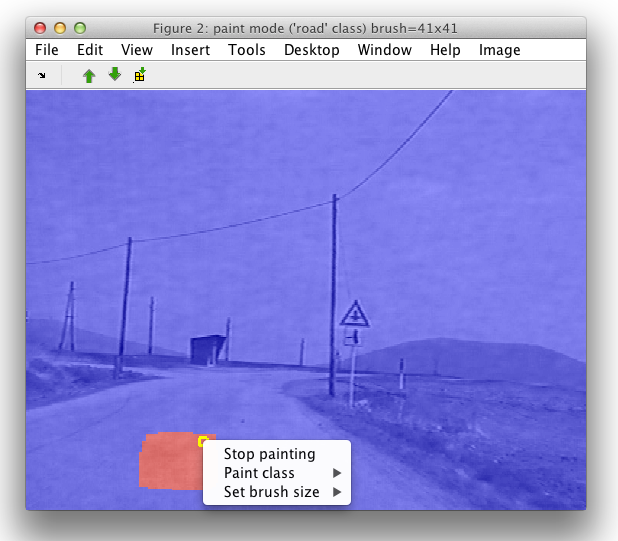 Alternatively, we may construct the full reject curve from classifier soft outputs with sdroc. This is useful to investigate performances at a set of reject thresholds. Technically, the reject option for pipelines with a single soft-output is implemented by a thresholding-based operating point. For discriminants, the reject threshold is added to the weighting-based operating point. This allows us to model both rejection types depending on the type of the soft output used. If the soft output was normalized with respect to all classes, the rejection operates close to the boundary. Without normalization, the rejection discard outliers. sdreject command adds the reject option to a trained pipeline. We need to provide it with the pipeline, data set used for computing the rejection threshold. By default, sdreject sets the threshold to reject 1% of provided data samples. Note that the soft outputs do not sum to one. That is because sdgauss returns class conditional densities. 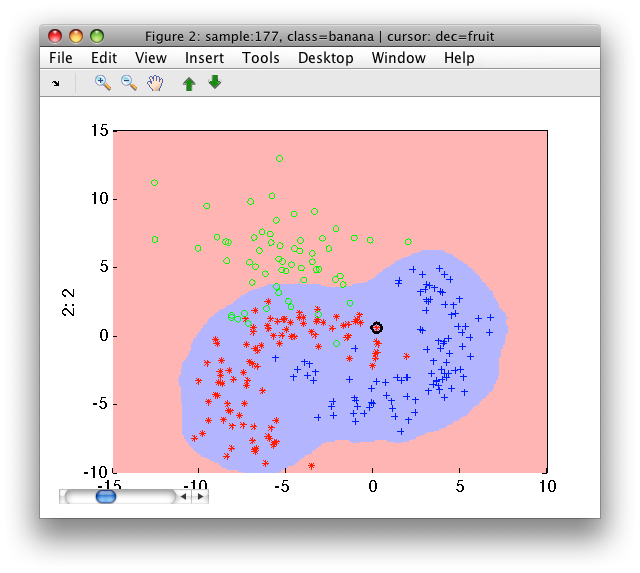 We can visualize the decisions using sdscatter. The horizontal axis represents the fraction of rejected objects; vertical the true positive ratio for the first class. By moving out of the default operating point (where rejection is not performed), we can observe how rejection takes place far from both trained distributions. We can see that the confusion matrix contains the added reject decision. To illustrate the rejection close to the decision boundary, we will continue in the example above. We make a single change in the procedure above: we normalize the model soft outputs to sum to one. 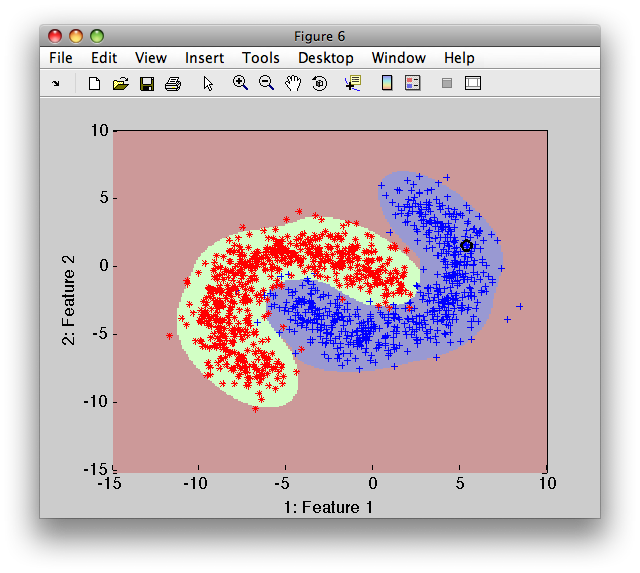 Note that the classifier outputs are now posterior probabilitites, not densities. The red reject decision now occupies the area where errors would be highly probably.